Soon available at JapSamBooks.nl and at your local bookstore! We asked Kenneth Goldsmith – a conceptual poet who believes that art and poetry can be found everywhere – to talk about a celebrated sculpture by Giacometti. Here is how he answered:. 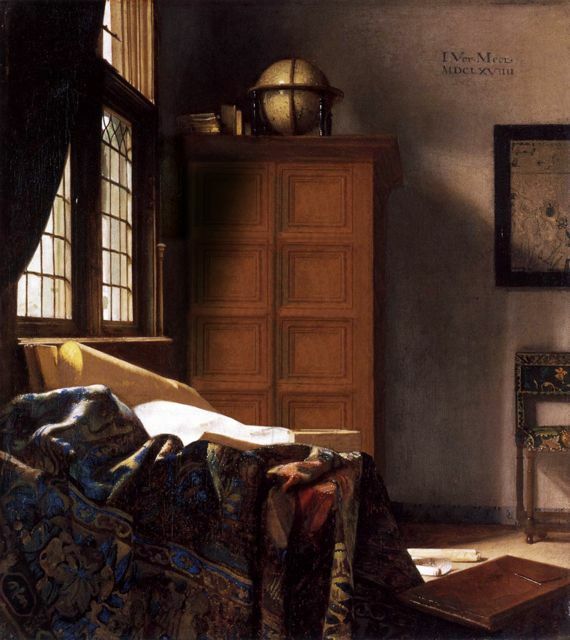 “Vermeer created such intimacy, it is hard not to get personally touched when studying the paintings. It is surprising that we know so little about the painter and his models with whom we are able to feel so related with. The photograph was taken in La Défense, the corporate district of Paris, in 2014. ‘I made several sketches, photographs and sound recordings over the course of a few weeks. Especially rush hour is an interesting time to visit the area. As this neighbourhood is located on the outskirts of Paris, many people have to commute to work. 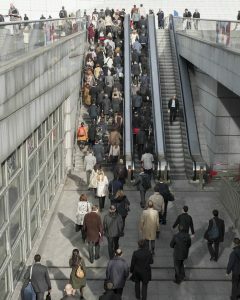 The architecture is constructed to make this process run smoothly, almost turning people into cattle. Their footsteps echo through the district like an approaching army’. 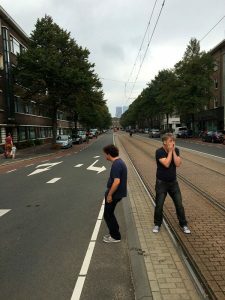 On December 5th, 2017, Frans van Lent and ieke Trinks walked the same route through the streets of Nicosia, Cyprus, in opposite directions, passing one another repeatedly at different points. They started walking at 11:15 a.m. and ended at 1 p.m. The route was near the check point on the occupied side of the old city center. The route was determined ahead of time and consisted of winding streets that form in a loop and took approx. 11 minutes to walk. 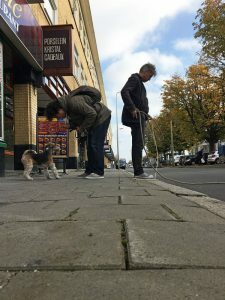 Every time Frans and ieke met they each marked the spot on the pavement with chalk to indicate the time and place. They met for 21 times. 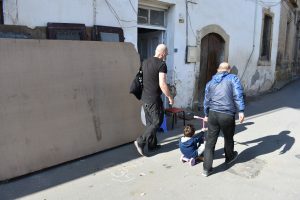 Meeting 5 – traces was performed for the second time during the Urban Emptiness Festival in Nicosia, Cyprus, 2017. Meetings is a collaboration between ieke Trinks and Bernard Roddy. “In the ongoing dispute between the environment and the political economy, it occurs to me that nature fails to understand the fundamental characteristics which define recent economic developments. Perhaps if we could teach our environment about the prosperity of a capitalist model, then nature might surrender its unreasonable demands, which have up to this point, inhibited economic growth. We certainly cannot teach environmentalism to capitalists”. Series of random uninspired moments in the daily practice of Topp & Dubio. All pictures are taken in the hometown of the artists. Topp & Dubio study and scrutinise reality from a conceptual starting point, often arising from sudden moments of curiosity and a desire to explore parallel worlds. Their projects flawlessly deal with fact and fiction, the concept of art and daily life, the personal and the public, observation and participation, authenticity, history and documentation, the romance of imagination and the absurdity of reality. 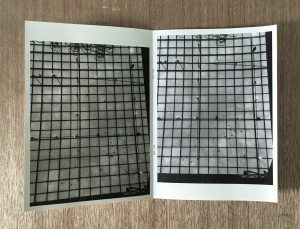 A5, 12 pages, black and white laser, saddle stitched, open edition. 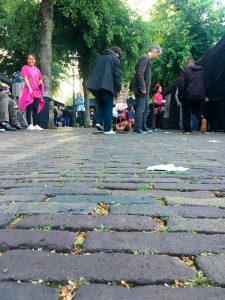 “The booklet was part of a larger project I did called Making Public the Making Public. 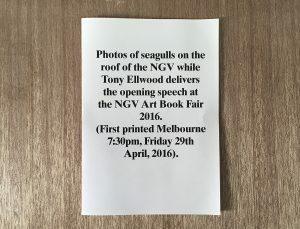 In 2016 the National Gallery of Victoria had their second Art Book Fair and instead of selling books at a stall, I set up to make books that responded to the site. There were 12 booklets in total (‘seagulls’ was the most popular), produced very quickly and with minimal equipment during the two and a half days of the fair. I made them and gave them away for free during the fair”. With an obsession for personal documentation I have kept a detailed daily account of my online life in now discontinued or steadily fading online social media platforms(Twitter, MSN Messenger Chat Logs, Blogger, etc.). I select passages from these platforms and submit them into a repetition text-based algorithm. This algorithm selects, at random, text ranging from single words to four consecutive words. It deconstructs the inputted text in this pattern, providing a collection of disjointed paragraphs, which I then decipher. I select stand out phrases/word patterns and use these as the base for creating my piece titles and accompanying writing. 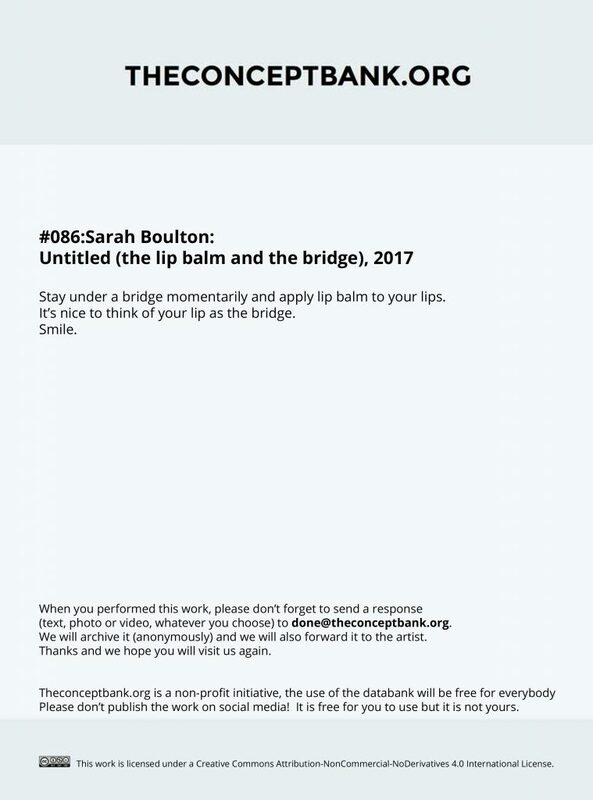 The end result is an entirely new interpretation of words written in the past, during a time when the words had completely different connotations. In this new presentation the words are repurposed, creating a forced cycle of repetition.